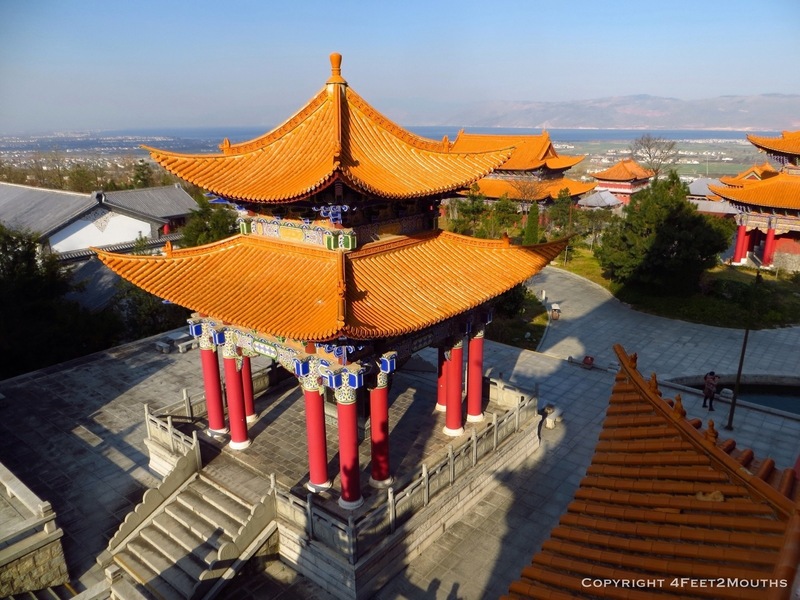 Dali is a town with Erhai Lake to its east and tall mountains towering over it to the west. It may be small in size but it has a long history. 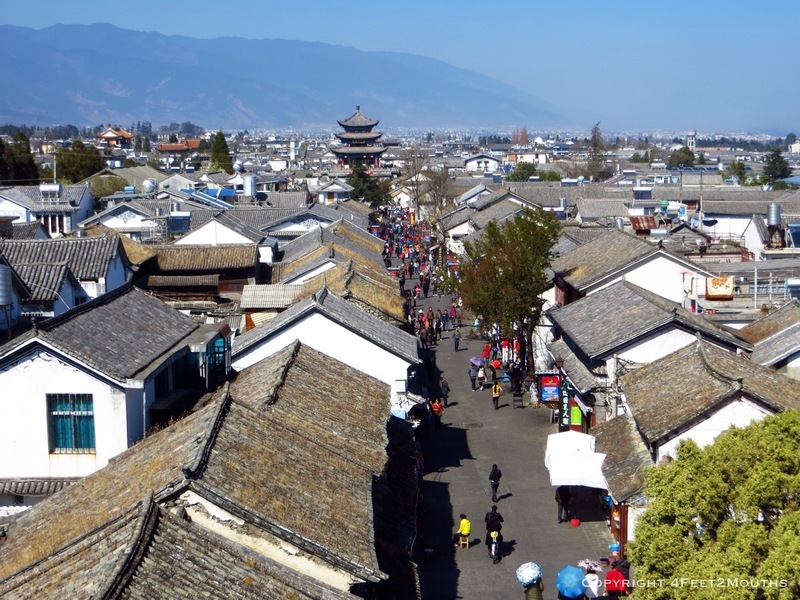 Centuries ago, it was the capital of the Yunnan region. 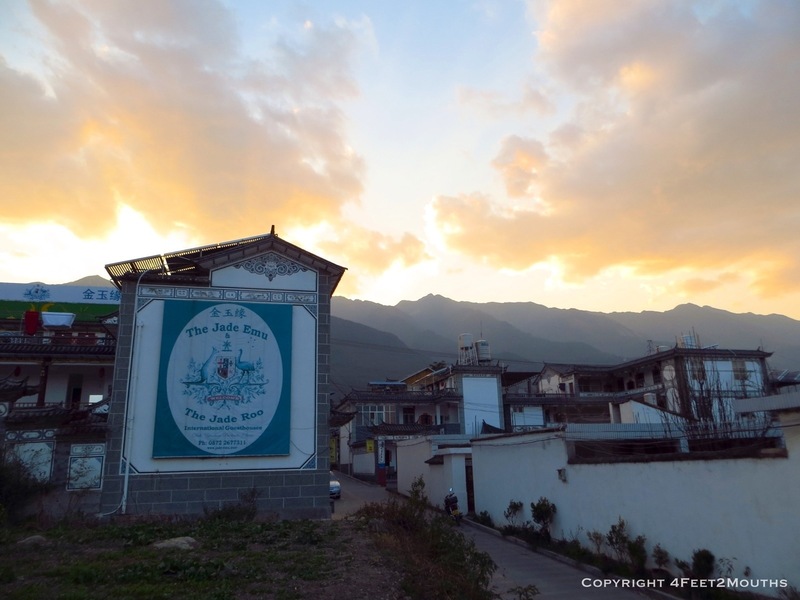 Today, it retains a pretty, old town atmosphere as well as cultural ties to the Bai, a tribe that has lived in this valley for thousands of years. Our introduction to Dali occurred with the great hostel search. Unfortunately we got lost on our way to the hostel but we did find a Bai market near the western city gate. I loved the mounds of natural brooms as well as the chili vendors that were grinding fresh chilies into powder right before your eyes. We finally did make it to our hostel, the Jade Emu, right around sunset. It was a lovely place with special touches for the western traveler. For example, free access to an Internet portal that allows you to view sites typically banned in China! 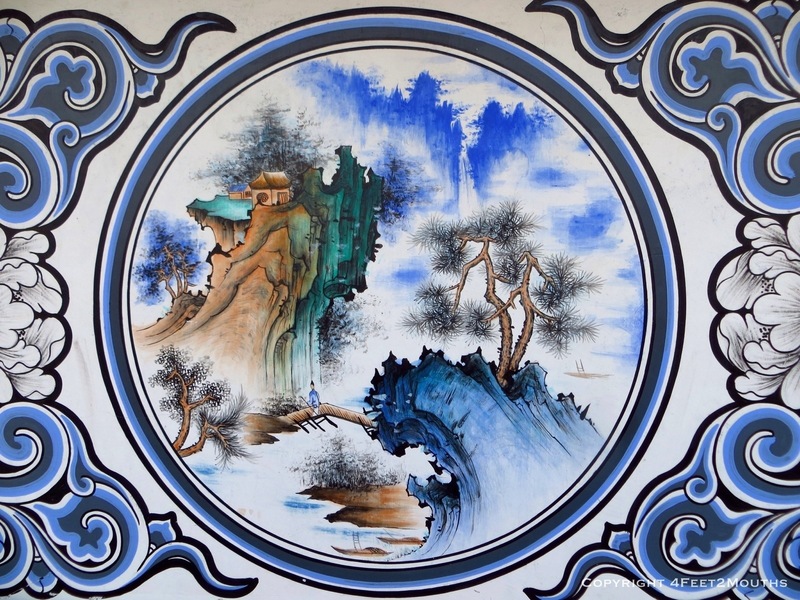 It was also decorated with splendid paintings that we saw on many of the homes in the area. We quickly left for dinner and ended up at Cang Er Chun. 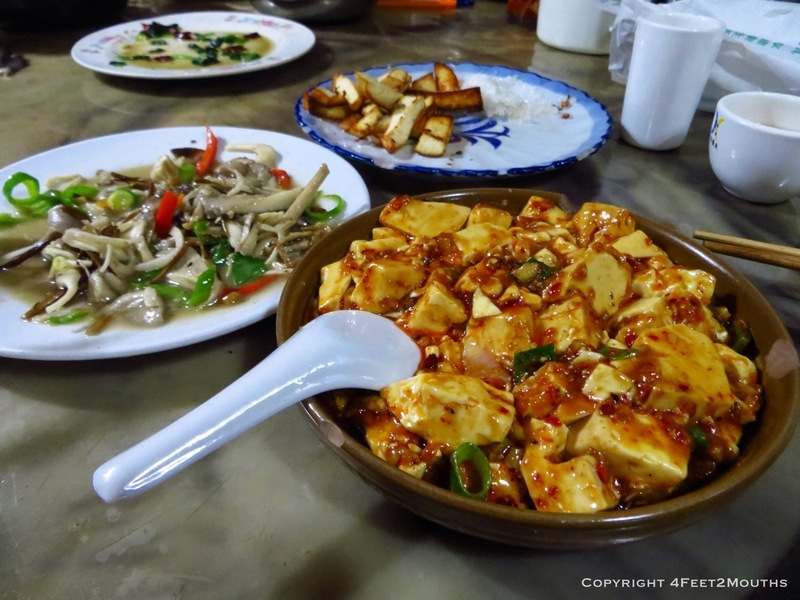 We are trying to maximize consumption of the famous Yunnan mushrooms so we ordered a dish of them, some fried local goat cheese (oddly served with sugar) and ma po tofu. The latter is one of my favorite dishes and I welcomed the numbing spice of the Sichuan peppercorns. Afterwards, we walked around and found an expat bar with a Scottish band playing some songs. 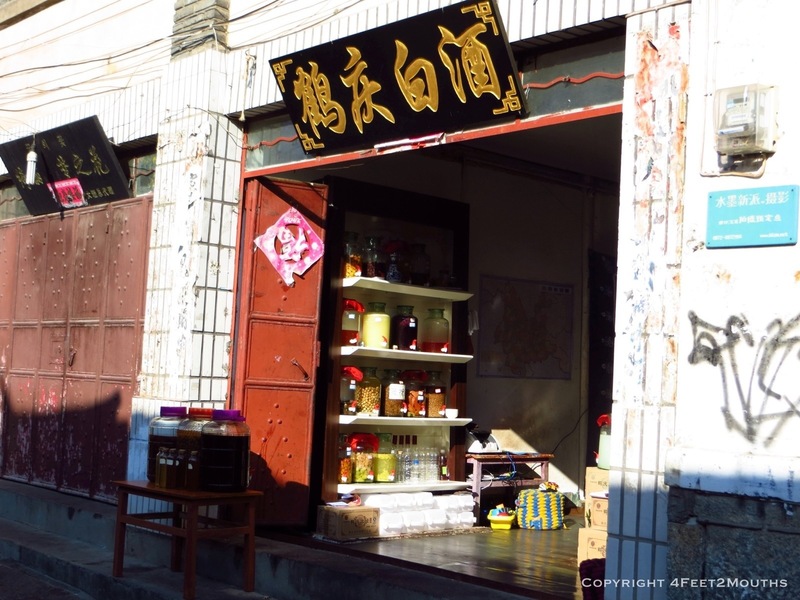 Dali definitely has a foreigner presence attracted to its cute surrounds. But this bar had a good mix of Chinese and westerners grooving to the tunes. The next morning we were ready to explore the old town. 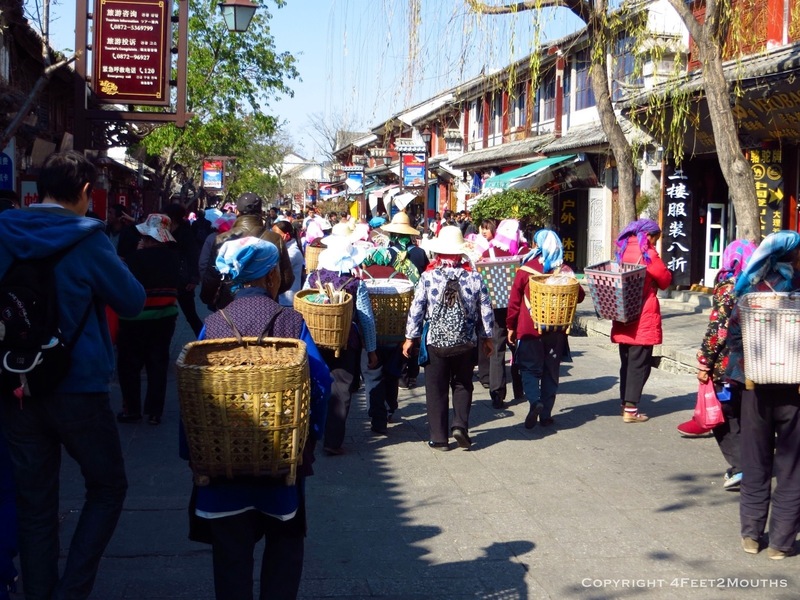 Many of the Chinese tourists congregate on the tourist shopping streets, which aren’t very interesting. But it’s easy to get away from the crowds. It was pretty much just us as we walked along the south city wall. At the end was a small temple to overlook the town and lake. 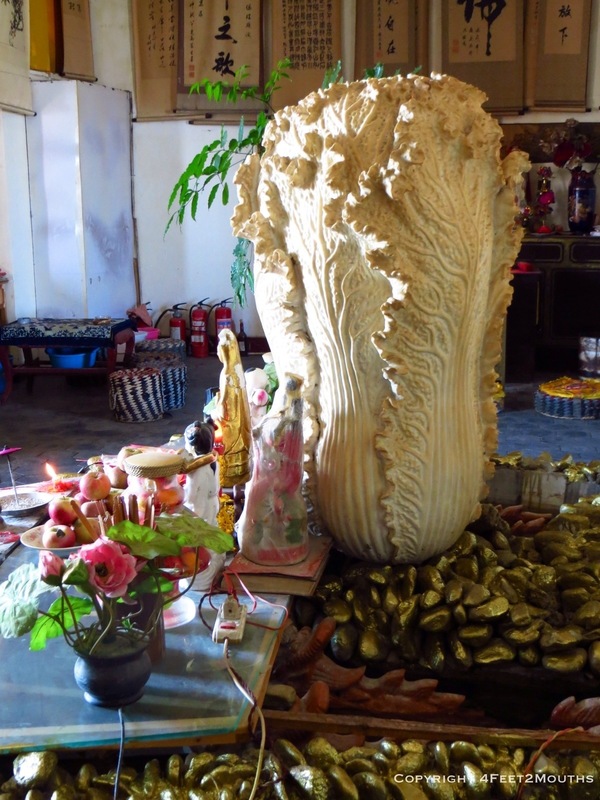 Inside the temple, there was a awesome carved napa cabbage at the center of an altar. Evidence of the importance of good food in China. 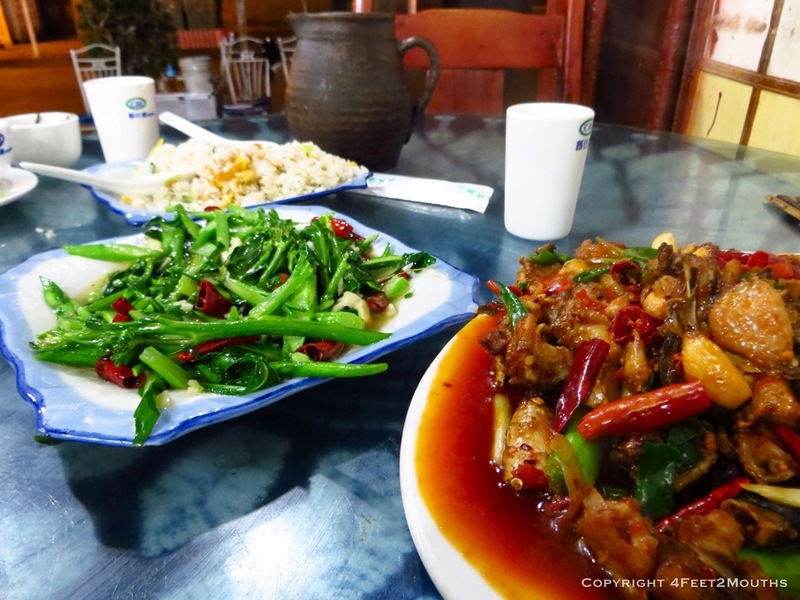 Near the city wall, a Buddhist restaurant called Yi Ran Tang serves a very inexpensive buffet. You can pile as much as you want on your plate for about $1 but the catch is that you have to eat everything you take. I’m talking every last grain of rice. Nathan and I practiced scooping rice grains with our chop sticks in their peaceful, newly built courtyard next to the buffet. We kept the religious theme going by visiting the town’s Catholic church. It was the most unique church I’ve ever been to since it was built in the Bai style of architecture. We marveled at the exterior paintings, which didn’t have much to do with Christianity, and took a peak the blue painted interior. 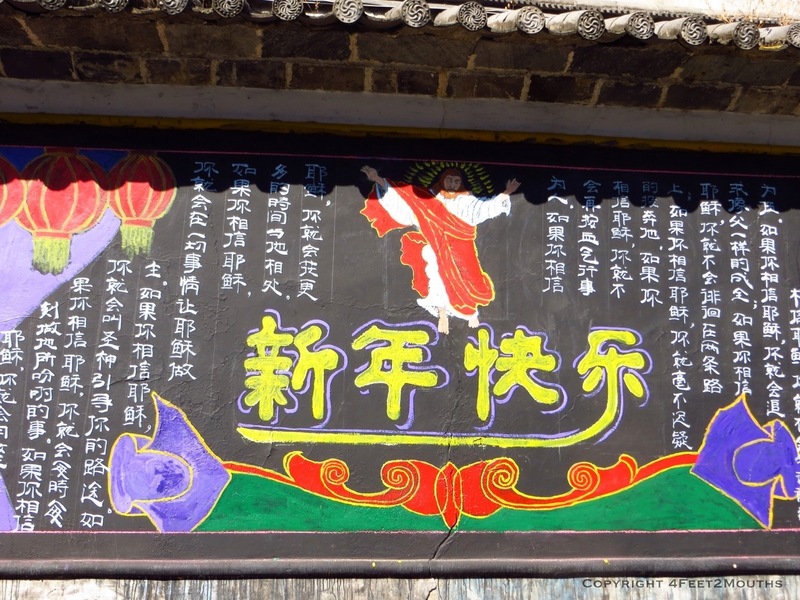 They provided a flyer describing the church’s difficulties during the cultural revolution as well as explaining how “Jesus Christ started the Catholic Church before he died…”. Hmmm. 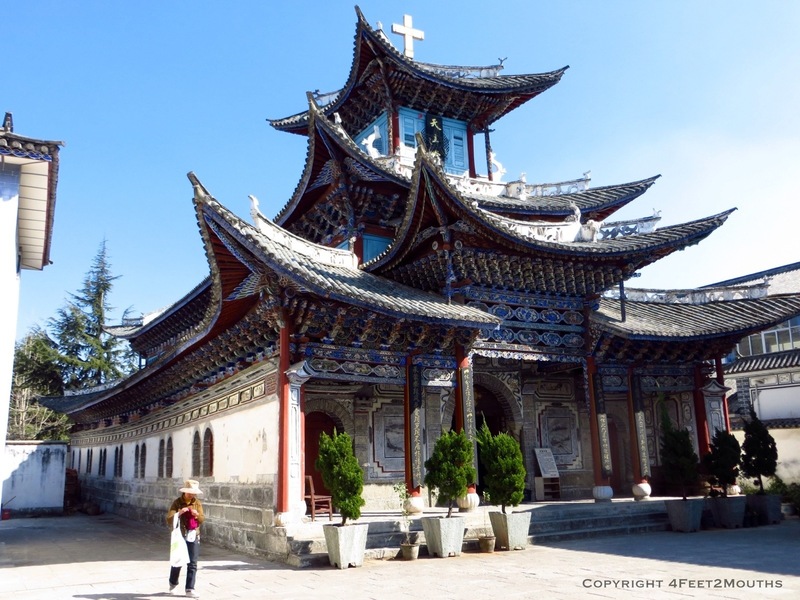 I thought the building was a really cool cultural fusion and is definitely worth seeking out in Dali. 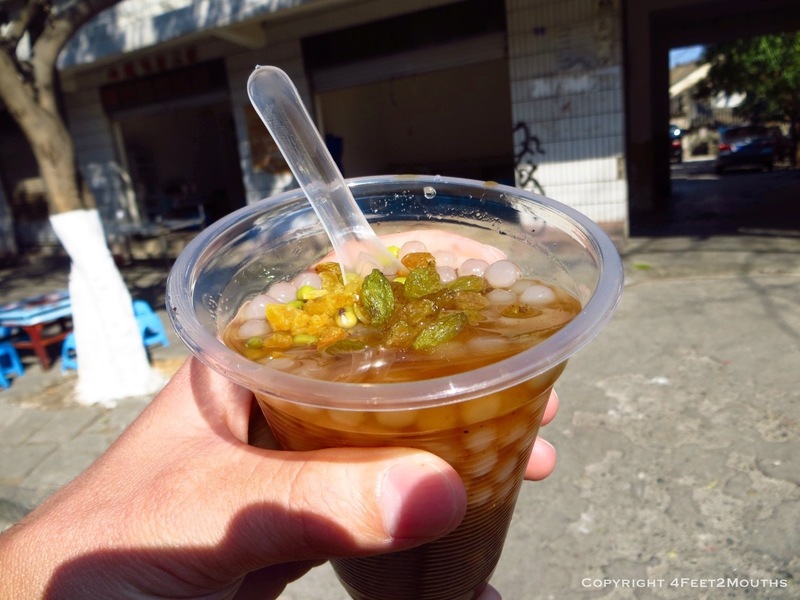 As a refresher, Nathan couldn’t pass up a chance to try a sour tamarind drink from a popular street vendor. She spent time on each cup, sprinkling in a variety of a spices and juices, resulting in a nicely sour treat. We saved the afternoon for Dali’s major historical attraction, the three pagodas. The tallest of these is 16 stories and built in the mid 800s! It is amazing it has lasted this long though I’m not sure how many restorations it has had. Behind the pagodas a series of temples stretches at least a kilometer uphill. 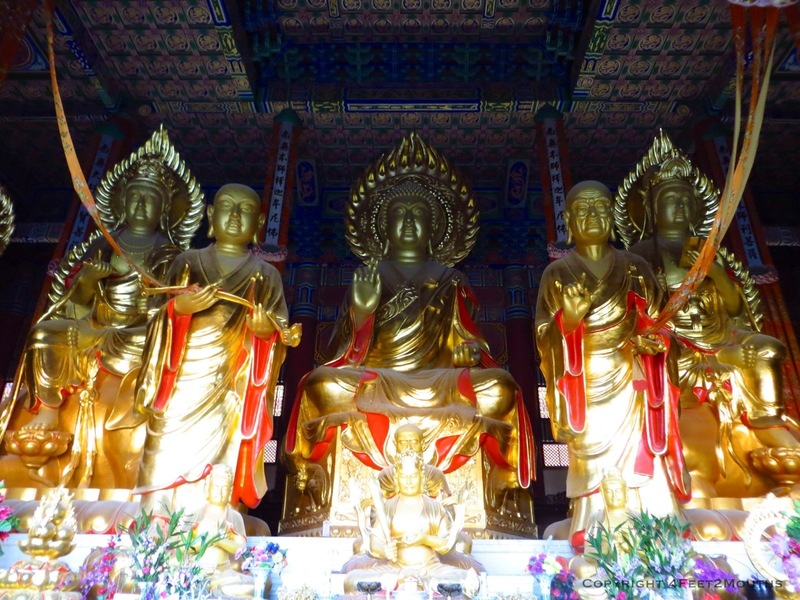 Each temple ensconced beautiful statues of Buddha, Buddhist leaders or local gods. The ticket was expensive (most are in China) but well worth it. We finished off the night by choosing the restaurant with the most diners in it. Our pointing got us some greens, fried rice and a spicy, garlicy chicken dish. I liked the chicken but there were so many bones it took forever to eat. This is true of a lot of Chinese chicken and fish dishes. Our last day in Dali we spent a bit more time in the old town. As we walked around we noticed a group of Bai women moving in a hurry. We followed them as they rushed their way through the main tourist drag, stopping to say hello to a few shop owners. I’m still not sure why they were rushing so, but what sticks out in my mind was a middle aged woman with a deformed foot. She was keeping up with the others by hopping along on her one good foot. I wonder if she didn’t have a crutch by choice or if it was the poor medical care. Probably the latter, which shows the dichotomy of rich Chinese tourists and poor locals. Reminders are everywhere! We did do some shopping ourselves, at the local baiju (rice wine) shop. The owner had created a number of specialty flavors and we settled on a pineapple-rice liquor that had a sour, sweet and slightly fermented taste. 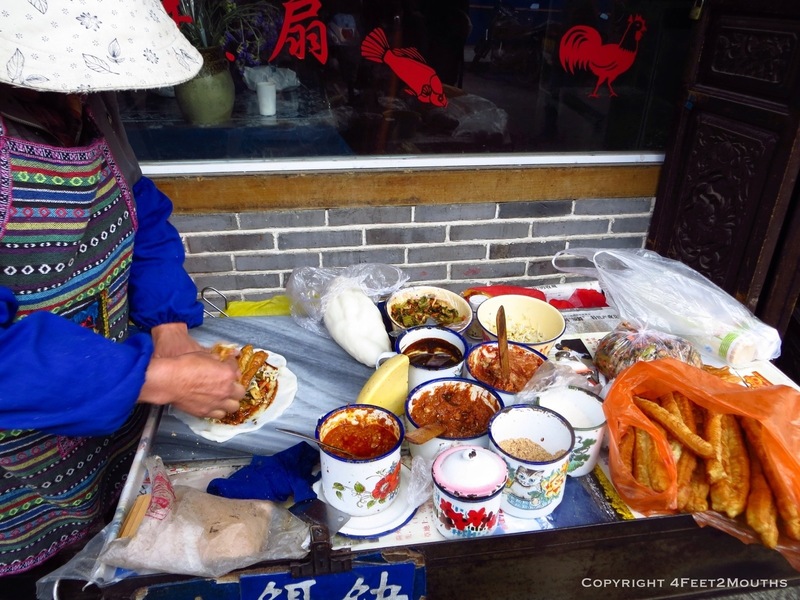 Nearby, a woman was selling some delicious shao er quai, a street snack Adam had recommended. It is rice pancake that is grilled and smeared with a variety of sweet, nutty and spicy sauces. This is wrapped around a Chinese doughnut and served warm. Good stuff. This lady was particularly good because she rolled out the rice pancake fresh, instead of having pre-made ones ready to heat up. Our final stop was to satisfy our sweet cravings at a cafe appropriately named Sweet Tooth. 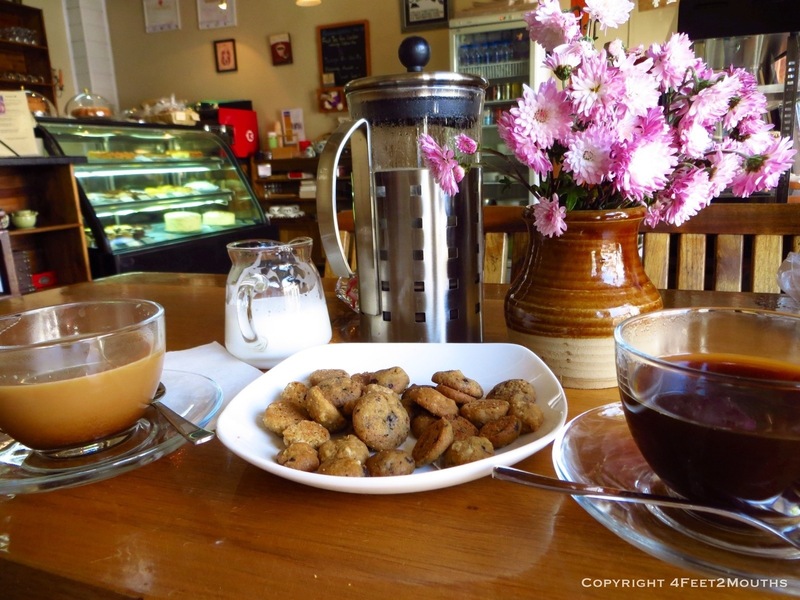 Our French pressed coffee was great and the tiny cookies were spot on. Chocolate chip, white chocolate, oatmeal raisin…it’s been so long. 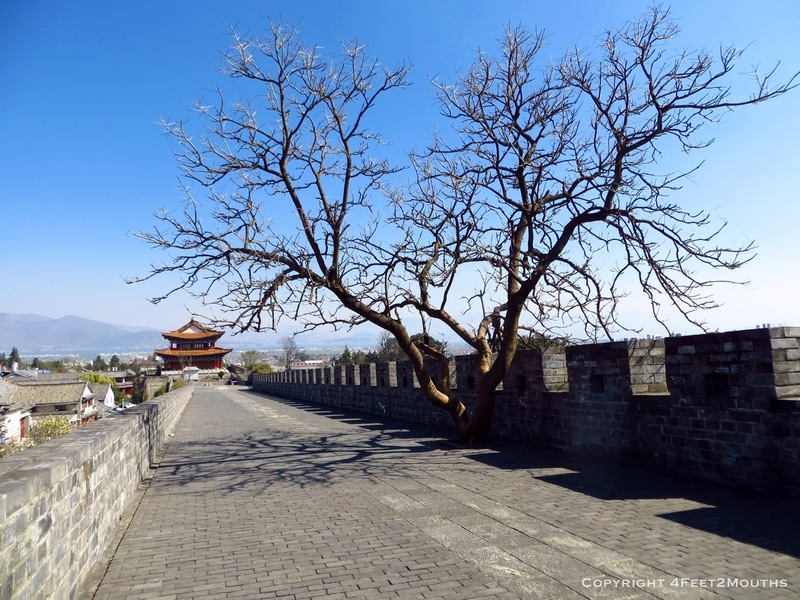 Before long it was time to board a bus to our next destination, Shaxi. 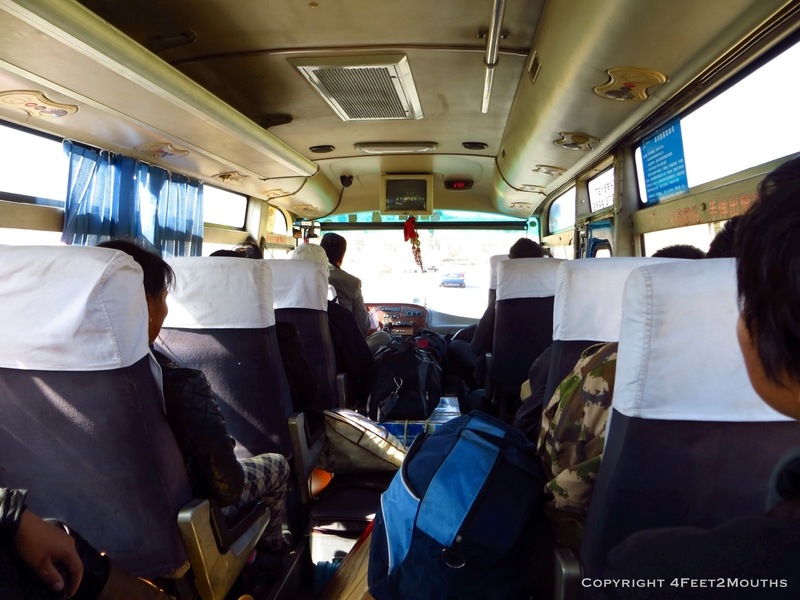 We crowded on to the local bus, chatted with a friendly English speaking local and wound our way higher in the mountains (and deeper into the cold!). Thanks Shelley. 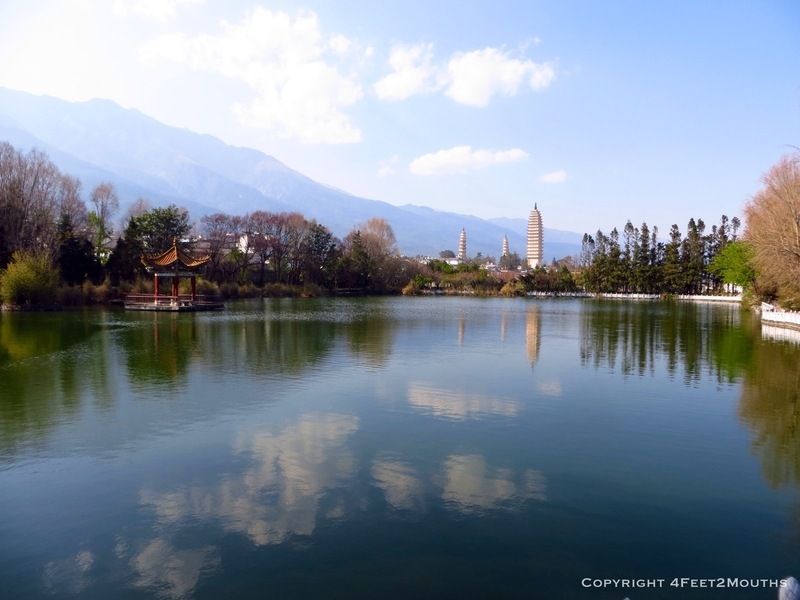 We did visit Lijiang. The post comes out on Monday. It is definitely a maze of constant shops, the old-style new buildings are also very picturesque. 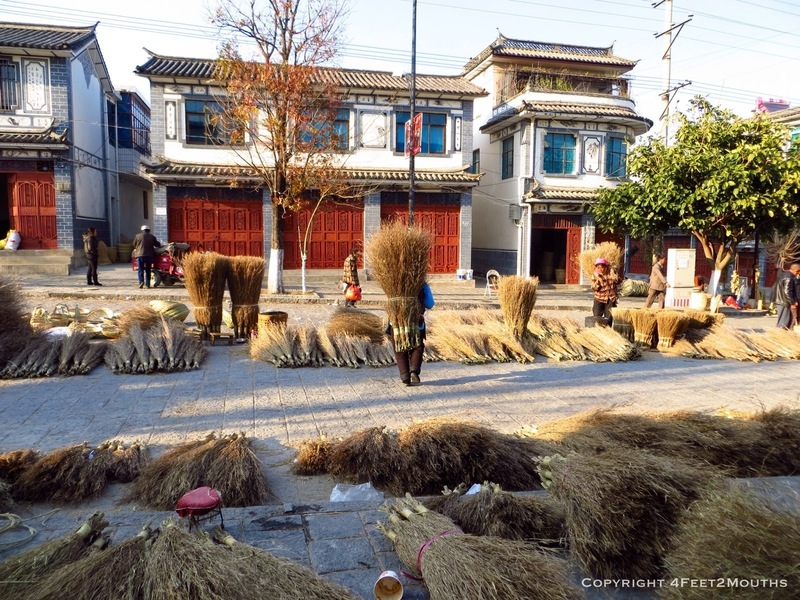 Have you been to Shaxi? Lovely photos. 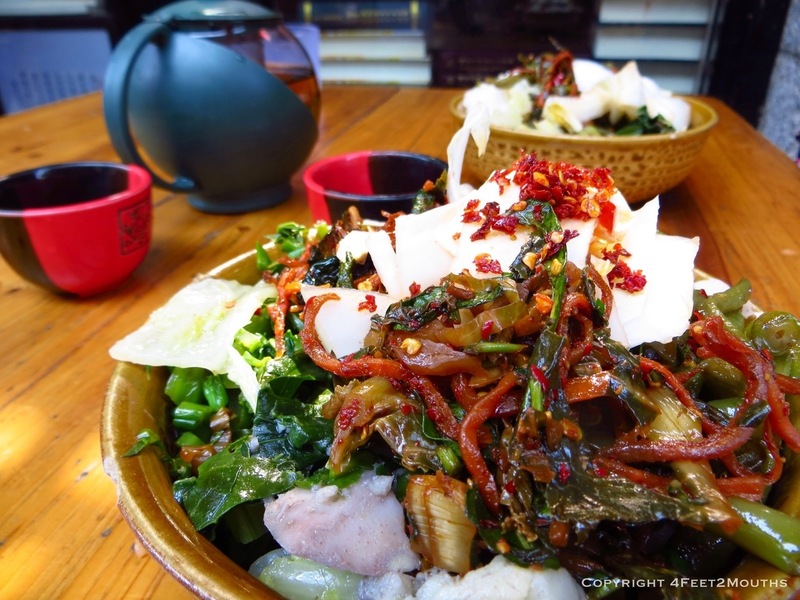 I especially love the brooms and Napa cabbage! I love the holy cabbage alter too! I smile just thinking of it. You got it, and that vegan food was pretty awesome!